The Slooh Community Observatory's telescope in the Canary Islands captured this view of Comet Lovejoy on Jan. 29, 2015. The beautiful, green-hued Comet Lovejoy made its closest approach to the sun early Friday morning (Jan. 30) and should put on a dazzling show for skywatchers in another week or so. Comet Lovejoy— known officially as C/2014 Q2 (Lovejoy) — came within 120 million miles (193 million kilometers) of the sun in Friday's wee hours, or about 1.3 times the Earth-sun distance. The comet is near its maximum luminosity in Earth's sky right now, astronomers say, but a bright and waxing moon makes spotting Lovejoy tough at the moment. "The comet will only be slightly less bright than it is right now; the tail may be just as long and beautiful, and the moon will be out of the scene," astronomer Bob Berman said during a Lovejoy sun-approach webcast by the Slooh community observatory on Thursday (Jan. 29). "So, for those who can visit those friends in the country and get out of the lights of town, I'd say mark that on your calendar — February, especially [Feb.] 6 and 7," Berman added. "Boy, will the comet be in great position in the night sky for we who live in the Northern Hemisphere." For people who live in the United States, Canada, the United Kingdom and other northern countries, that position will be pretty much straight up, Berman said. "Go from Aldebaran, the brightest star in [the constellation] Taurus; draw a line from there to the Pleiades; extend that an equal distance, and beyond it — that'll take you to near where the comet is," Berman said. "Sweep that area with your binoculars, especially when the moon is absent, and you'll be in for a treat." Comet Lovejoy is moving north in the sky and will continue to do so over the coming months, Berman added. In fact, by the end of May, the icy wanderer will be next to Polaris, the North Star (though by that time, Lovejoy will be so dim that skywatchers will need a telescope to see it). 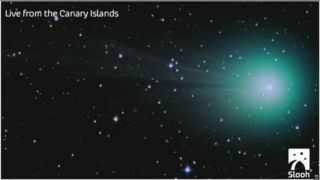 Lovejoy's distinctive color is caused primarily by diatomic carbon (C2), which glows green when it's stimulated by sunlight, Berman said. C/2014 Q2 (Lovejoy) was discovered in August 2014 by Australian amateur astronomer Terry Lovejoy, who has spotted a number of other comets. Another one of his finds, for example, was Comet C/2011 W3 (Lovejoy) — somewhat confusingly, also referred to in shorthand as Comet Lovejoy —which dove through the sun's atmosphere in December 2011. Editor's note: If you capture an amazing photo of Comet Lovejoy with binoculars or a telescope and want to share it with Space.com, you can send in images and comments to managing editor Tariq Malik at: spacephotos@space.com.